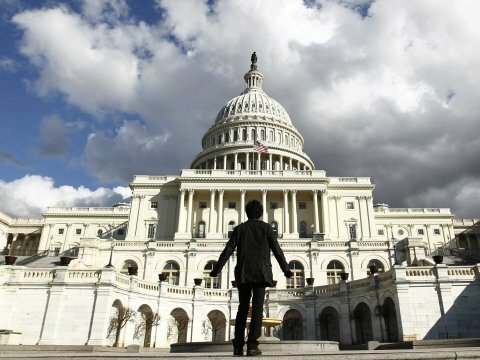 A tourist gazes up towards the dome of the U.S. Capitol in Washington. If Congress can’t agree on a budget deal, then the government will “shut down” on Tuesday. Meanwhile, it’s jobs week in America. On Friday, the Bureau of Labor Statistics is scheduled to release the September employment situation report, which the Federal Reserve will watch closely as it considers its plan for tapering its stimulative large-scale asset purchase program. Unfortunately, there’s a chance the jobs report will get cancelled. However, a shutdown would mean that much of the high-frequency, market-moving economic data we get won’t be published. “All survey and other program operations will cease and the public website will not be updated,” said Erica Groshen of the Bureau of Labor Statistics. Dallas Fed Manufacturing Activity (Monday): Economists estimate the Dallas Fed index was unchanged at 5.0 in September. Markit U.S. PMI (Tuesday): Economists estimate U.S. PMI registered at 53.0. Any reading above 50 signals growth. Initial Jobless Claims (Thursday): Economists estimate that initial claims climbed to 313,000 from 305,000 last week. “Last week, the Labor Department indicated that there were no special factors affecting the data, but we will wait to see if last week’s 305k level holds,” said Deutsche Bank’s Ryan. ISM Non-Manufacturing Index (Thursday): Economists estimate the ISM services index fell to 57.0 from 58.6 in August. “We expect the non-manufacturing index to hold onto its August gains in September because the new orders component rose to its highest level since February 2011,” said BAML’s economists who are looking for a reading of 58.5. “We estimate that little or no volatility premium for the debt ceiling debates is priced into the options markets on stocks most exposed to government spending cuts,” said Goldman Sachs’ Robert Boroujerdi. And while the options markets suggest investors aren’t worried about downside, there’s also little to suggest investors are betting on upside. Lee thinks the SP 500 could end the year at 1,775.